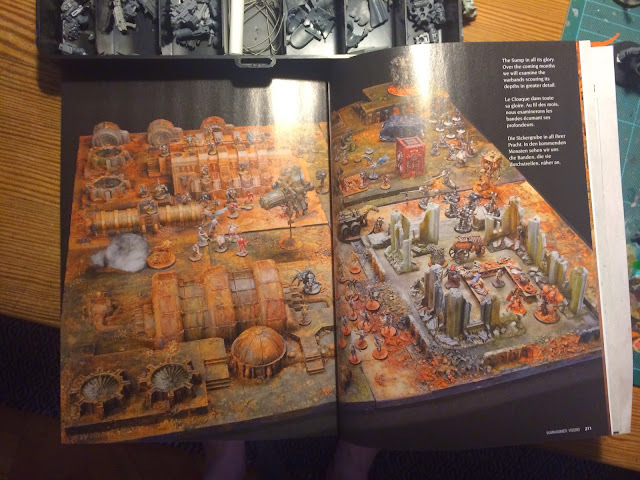 This is admittedly old news by now, but I finally managed to pick up the latest Warhammer Visions. Besides the rather lacklustre and just appallingly uninteresting 50 or so pages devoted to new-ish tyranid models the december issue does have some really nice features. A great, though rather short, showcase of blightkings, lots of GD entries and a bunch of cool army features. There's also the first installment in what promises to be a series of Blanchitsu articles about John's "sump" board and the quite spectacular inquisimunda game we played on it this summer. This months feature is about the amazing board itself plus John, Pete and Neils characterful NPCs and unless you use a magnifying glass its hard to make out any of my minis. However, further articles will focus on the various gangs and the game itself - so stay tuned. The most inspiring reads for a long time have been those on the various Inquisimunda tales over the last years! So this is a very good reason to get the coming issues of Visions. Thanks for the heads-up Vader. In all honesty they should flip the format somewhat. They should just produce a Blanchitsu where they cover the weird and wonderful and leave five pages at the back for a brief overview of new models. That said they should definitely focus on readers projects (like Blanchitsu), GD entries, armies on parade, conversion guides and other hobby articles instead of devoting so much space to miniatures the readers already have seen from every possible angle online and in White Dwarf. Let WD be the product catalogue and let WH:Visions be a inspirational/hobby magazine it could be I say. Personally i would pay for a quarterly Blanchitsu only magazine. Make it duluxe hard cover and I'd still buy it. where is possible to find the rules for Inquisimunda ? Also try google and see what you can come up with - it´s not an official game so just whatever rules you fancy.